As a result of today's complex healthcare system a new senior service has emerged. Geriatric Care Management has grown immensely in recent years due to the fact that many seniors are finding themselves lost in a maze of health professionals, institutions and family stresses. 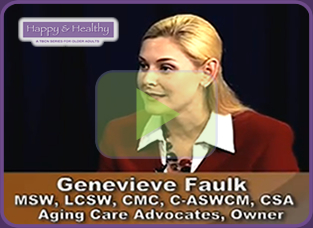 Geriatric Care Managers are professionals with their degree in Social Work or Gerontology. They have the knowledge and experience to assist seniors and their families with long term care arrangements, everyday issues, and advocacy. In our commitment to provide the highest quality care and support to the senior community, we are proud to offer such services to our clients. Our team of Geriatric Care Managers can perform in-home assessments for seniors to identify problems and recommend possible solutions. Based on this assessment, they can offer referrals to medical services, legal and financial services, home care, and many other community resources. Our Geriatric Care Managers have referred their clients to services such as: Meals on wheels, home care, emergency buttons, psych services, eldercare attorneys etc. Our care managers often act as a connecting bridge between the senior, their family members and supporting services that are offered in the Bay Area. They can coordinate all the services and keep in touch with verbal and written reports so the family members are always informed about their senior loved one. Our Geriatric Care Managers recommend services that enable the senior to continue to reside safely at home for as long as possible. If and when a senior does have the need to move into a retirement community, assisted living facility or nursing home the GCM can assist with this process in order to make certain that this move is the most appropriate for the senior based on their unique needs. Once the senior has moved, the GCM can help them by visiting regularly and making sure their client's best interest and safety is in mind. The main goal of Aging Care Advocates is to assist seniors and their loved ones in making the best decisions for them and their well being based on each unique circumstance. If you feel you would benefit from the services of Aging Care Advocates, call Aging Care Advocates today.